Newer iPhones have the ability to track fitness activity and motion and displaying that data in Health app and other applications. Fitness tracking is done by using a low-power motion coprocessor that determines steps, altitude gain and lost, and distance traveled, and many users like this feature as it represents an easy way to keep an eye on their activity levels, and perhaps work towards that goal of an active 10,000+ steps per day. 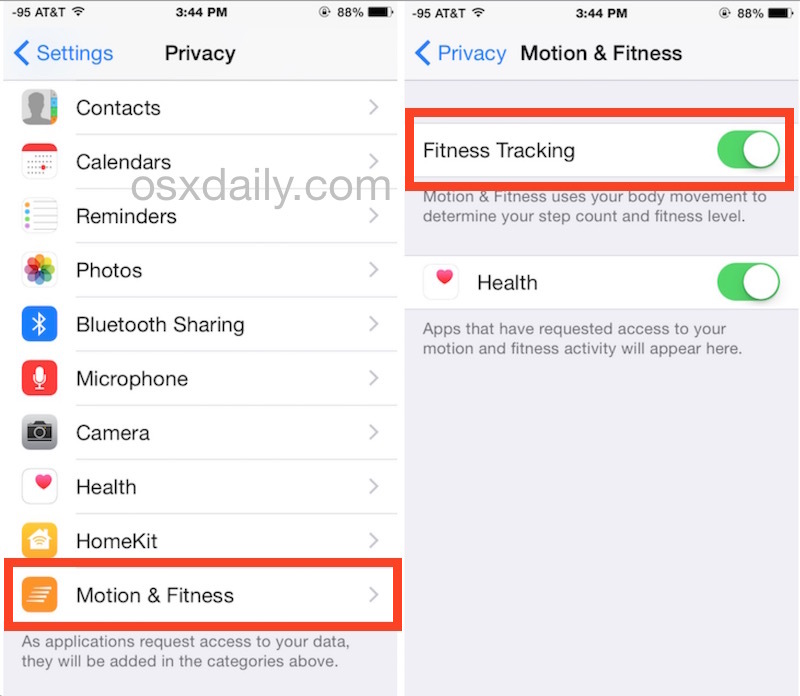 Fitness tracking is turned on by default in iOS, which can enable the iPhone to serve as a pedometer of sorts, but if for some reason you want to turn the motion detection feature off on your iPhone, you can do that too. If you had this off and turned it on, you’ll still need to enable the appropriate options within Health Dashboard to actually see and monitor your activity data on a meaningful graph. Keep in mind this disables the tracking feature entirely for all apps on iPhone, not just within Health app. If you turn this off, the pedometer feature and all related fitness activity monitoring functions on iPhone will cease, whether you read that data in Health or a third party app. Disabling fitness tracking leads to an empty Health app dashboard, but not for erroneous reasons that can be quickly resolved, since the tracking is actually turned off. To reverse that, you’d obviously need to turn the feature back on again, but all fitness data and activity prior to turning tracking back on will not be available. Discovering your own fitness activity levels based on data from your iPhone can be somewhat shocking – either pleasantly or not – and it’s fairly common for many people who don’t think of themselves as sedentary to discover they barely move around throughout the day. If that’s something you want to change, and you probably should, PBS provides some advice on how to slowly increase your activity levels to get there. That an iPhone (or Apple Watch, or both) can help you in that endeavor is a nice bonus. No all iPhone should leave this on, americans really need this! May be give a little zap when the American is too inactive! Ha ha! obesity epidemic! It is truly amazing! This helps you track fitness and activity on the iPhone, it’s available worldwide on all new iPhone models. The target demographic of Apple Watch is not average people, it’s a specific consumer who is health conscious with high disposable income to spend on gadgets. There are a lot of people in the US and Europe who fit that description. But I agree, the average sloth is not going to buy one, unless they’re a geek and like the tech aspect of it. This is NOT work on iPhone 5s. iOS 8 does have tracking, but iPhone 5s does not have the optional setting to turn it on or off. It seems to be on all the time. Which I really hate, BTW. This does not work. Apple may call this a bug but I think it is by design. I have an iphone 6+ with the latest version of ios. Over a month ago I did just what this article suggest. Today I decided to enable the feature because I wanted to roughly measure my yard & thought the fitness tracking would be a quick easy way to do that. First I checked health app, sure enough no step data. Then I enabled fitness tracking & went back to the health app. Imagine my surprise to see an entire month’s worth of fitness tracking data! So even though I had it disabled & keep location services off at all times Apple was indeed tracking my steps & recording the data even though I had it turned off!!! If people want to use this feature fine but for those of us who don’t, “Off” should mean “off” ! I will be re-doing this test & recording my phone as I do it just to verify what I saw today. I will be posting my results to youtube. I love my Apple devices but this is horse excrement! If some smartphone manufacturer actually gives people real privacy control they could give Apple & Google some real competition! They also have the ability to turn your location services on even when you have it set off and it won’t show on your phone. However, the motion tracking doesnt use location services, only motion detection. So it doesn’t know where you were when you were taking steps, just that your phone bumped up and down a bunch in a steplike pattern. I have an iPhone 5 and I cannot seem to find the motion & fitness feature. Does my phone not have that? Hi, can anyone help me with my iPhone 5c? I can’t see my fitness & motion switch in my settings. I went to my settings and then privacy, I don’t see nothing. Does anyone know how to get this working please and thank you. The 5c does not have a motion and fitness tracker. If you want a pedometer, you’ll find that most pedometer apps will reject the download because they rely on that function. However, several do work – they must use something else. I just downloaded the Withings “Health Mate” app. Although it’s only Day 1 of my using it, it seems to work be counting pretty accurately so far on my 5c. I have iphone5, and i am unable to find motion and fitness option in my ohone, can you please help me out for the same???? @Geoff I discovered exactly the same thing. 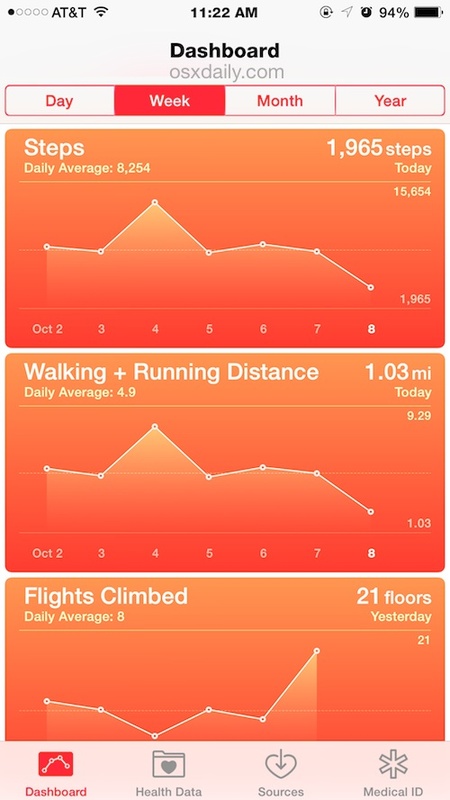 A couple of weeks ago I turned off fitness tracking on my 5s (iOS 8.4). I turned it back on today and found it had been logging my activity all this time. And they had the cheek to put this setting under privacy! The “Apple motion coprocessors” were first fitted to the iPhone 5, so no, the iPhone 4 will not have motion settings or count steps, but the health app comes with ios 8 and ios9 so you get the “non-functioning” App anyway! Hi, the motion and fitness tracker(pedometer) is present on the iPhone 5s model, just upgrade the O/S to iOS 9.1 and it works like a charm. The standing time chart does not work. Some other charts won’t function either. I have the iPhone 6. I filled out a medical ID, & turned on the motion & fitness on my phone. Every night& now even during the day, my heart has been palpitating so much , I can’t sleep. I went back in settings & turned it off but it will not allow me to completely remove the medical ID. Anyone else had this issue? Those asking if their 5/5C/5S has this… kind of. It has the ability to utilize it, but you need to make sure your iOS is up to date. I’ve had the 5S for 3 years and it was just within the last software update or two that the Health and Medical ID icons showed up. I’m not a huge fan of my whole life being locked away in my phone, so the ID stuff I haven’t done anything with. The health app I find to be informative when I want to look or put in some effort, but it’s far from enslaving. Nice feature to have and saved me from drinking the FitBit koolaid. I updated the last update ios 9.3 and there still isnt any motion and fitness that appears on my 5S. and everything is turned on. I agree Jackie. I can’t get it to work and have tried all the “secrets”. You need an iPhone 5s or later. I’ve used it on a 5s and now my 6s+ daily without any issues. My health app always worked perfectly on my iPhone 5 until recently. It refuses to register the steps I make now- and there is no ‘motion and fitness’ option to switch on. Any fixes please? Majority of American obesity is not due to inactivity. Average American actually has higher work load longer days than majority of developed countries. unfortunately they also have less vacation. Worse medical care. Higher stress levels and poor eating habits resulting in higher rate of obesity. I have an iPhone SE and it was not connecting. If fitness tracking is “on” but rally’s not showing up, go to rally app, Settings, motion &fitness. Disable “use tracking device”. Enable it again and go through the steps to connect. Hope this works for some! My iPhone 7 does not track steps on a treadmill. It is on an incline, and the number of flights climbed was showing as 4 after walking/running 3.2 miles! Something is definitely wrong. Current iPhone models track flights climbed by measuring altitude, so if you are on a stair stepper it would count the steps but not the flights since altitude is not changing. Each ‘flight’ is about 10 feet of altitude change, and it seems to count both up and down. You’d have to go up actual stairs, a road, trail, mountain, hill, something with a real incline that is changing altitude for that to track.